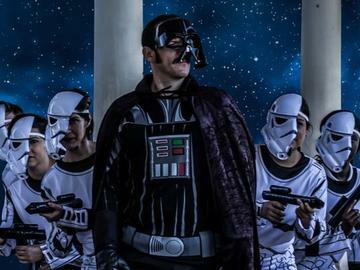 The Phantom of the Empire is the award-winning epic mash-up of the ORIGINAL STAR WARS TRILOGY told through the haunting music of THE PHANTOM OF THE OPERA. Featuring songs such as "Rescue Me", "We Can't Aim", and "I'm Not Nagging You", critics and audiences agree that this show is a can't miss! So grab your lightsaber and meet us at the Opera House! You are buying a SINGLE SHOW TICKET that will only gain you entrance to your chosen production of THE PHANTOM OF THE EMPIRE. If you wish to also see INTO THE WALKER WOODS, click here to purchase a double-feature ticket at a discounted price! *Does not include matinee show times.